He is the most beloved Manchester City manager of modern times, possibly ever! Under his charge, City tore down that banner at Old Trafford, ended a decades-long trophy drought, qualified for the Champions League, and won the Premier League in the most epic finale ever seen. And Roberto Mancini is in London to watch his former club face West Ham tonight. The dapper 52-year-old took to Twitter to reveal that he is heading to the London Stadium with his son Andrea, who was also on City’s books from 2010 until 2012, to watch City face the Hammers. 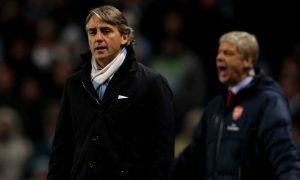 Mancini had another close encounter with Pep Guardiola days ago, when the two both attended PSG’s 1-1 draw with Monaco. Could we see the iconic former City boss meet up with some of his former players and staff tonight, for the first time since his acrimonious departure in 2013?